In late Autumn 2017, a lurid, hip hop-referencing beer appeared at Feral’s Swan Valley brewpub with little fanfare. As an early Australian expression of the then little known New England IPA style, it was soon attracting lines of growler-wielding trub-chasers, much to the surprise of product development brewer Will Irving. The scenes mimicked the hazy pandemic sweeping breweries through the USA. With no locally available examples, Australian punters were coming to grips with these massive lines thanks to Instagram in particular – this was really a dream! 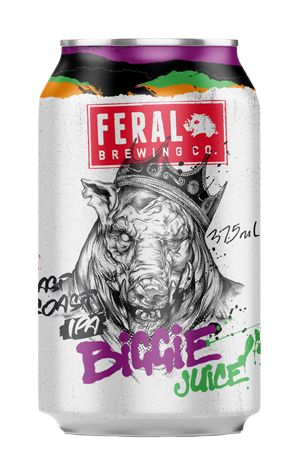 Since then, Biggie Juice has appeared as a semi-regular brewpub release and, as a sign of the times as much as recognition of its appeal, it now joins Feral’s core range at the expense of the outgoing black IPA, Karma Citra. Freshly attired with Dipesh Prasad’s crowned hog artwork, the juice bomb is in full production at Feral's large Bassendean brewery, allowing more capacity for innovation at the original Valley site. It's a transition that started before Christmas, with the step up in brew length requiring even more Amarillo, Galaxy and Vic Secret hops to retain the beer's pulpy mouthfeel and tropical flavour. The cans are labelled with a "Roll before opening" instruction that, if followed, maximises the fruity aromas of passionfruit and juicy orange. Supporting mango and subtle peach join the flow upon tasting along with the style's trademark soft bitterness.